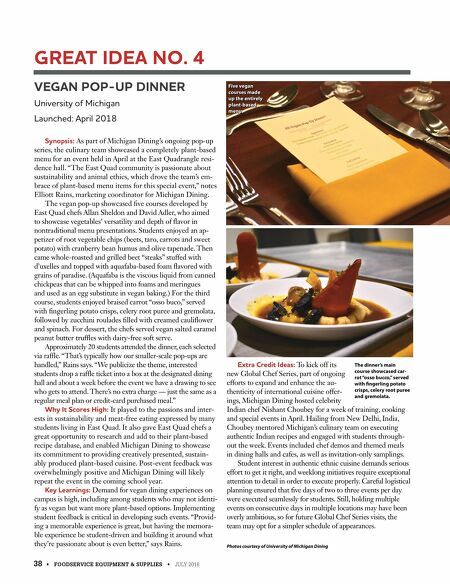 38 • FOODSERVICE EQUIPMENT & SUPPLIES • JULY 2018 VEGAN POP-UP DINNER University of Michigan Launched: April 2018 Synopsis: As part of Michigan Dining's ongoing pop-up series, the culinary team showcased a completely plant-based menu for an event held in April at the East Quadrangle resi- dence hall. "The East Quad community is passionate about sustainability and animal ethics, which drove the team's em- brace of plant-based menu items for this special event," notes Elliott Rains, marketing coordinator for Michigan Dining. The vegan pop-up showcased five courses developed by East Quad chefs Allan Sheldon and David Adler, who aimed to showcase vegetables' versatility and depth of flavor in nontraditional menu presentations. Students enjoyed an ap- petizer of root vegetable chips (beets, taro, carrots and sweet potato) with cranberry bean humus and olive tapenade. Then came whole-roasted and grilled beet "steaks" stuffed with d'uxelles and topped with aquafaba-based foam flavored with grains of paradise. (Aquafaba is the viscous liquid from canned chickpeas that can be whipped into foams and meringues and used as an egg substitute in vegan baking.) For the third course, students enjoyed braised carrot "osso buco," served with fingerling potato crisps, celery root puree and gremolata, followed by zucchini roulades filled with creamed cauliflower and spinach. For dessert, the chefs served vegan salted caramel peanut butter truffles with dairy-free soft serve. Approximately 20 students attended the dinner, each selected via raffle. "That's typically how our smaller-scale pop-ups are handled," Rains says. "We publicize the theme, interested students drop a raffle ticket into a box at the designated dining hall and about a week before the event we have a drawing to see who gets to attend. There's no extra charge — just the same as a regular meal plan or credit-card purchased meal." Why It Scores High: It played to the passions and inter- ests in sustainability and meat-free eating expressed by many students living in East Quad. It also gave East Quad chefs a great opportunity to research and add to their plant-based recipe database, and enabled Michigan Dining to showcase its commitment to providing creatively presented, sustain- ably produced plant-based cuisine. Post-event feedback was overwhelmingly positive and Michigan Dining will likely repeat the event in the coming school year. Key Learnings: Demand for vegan dining experiences on campus is high, including among students who may not identi- fy as vegan but want more plant-based options. Implementing student feedback is critical in developing such events. "Provid- ing a memorable experience is great, but having the memora- ble experience be student-driven and building it around what they're passionate about is even better," says Rains. Extra Credit Ideas: To kick off its new Global Chef Series, part of ongoing efforts to expand and enhance the au- thenticity of international cuisine offer- ings, Michigan Dining hosted celebrity Indian chef Nishant Choubey for a week of training, cooking and special events in April. Hailing from New Delhi, India, Choubey mentored Michigan's culinary team on executing authentic Indian recipes and engaged with students through- out the week. Events included chef demos and themed meals in dining halls and cafes, as well as invitation-only samplings. Student interest in authentic ethnic cuisine demands serious effort to get it right, and weeklong initiatives require exceptional attention to detail in order to execute properly. Careful logistical planning ensured that five days of two to three events per day were executed seamlessly for students. Still, holding multiple events on consecutive days in multiple locations may have been overly ambitious, so for future Global Chef Series visits, the team may opt for a simpler schedule of appearances. Photos courtesy of University of Michigan Dining GREAT IDEA NO. 4 Five vegan courses made up the entirely plant-based menu. The dinner's main course showcased car- rot "osso bucco," served with fingerling potato crisps, celery root puree and gremolata.